After spending a day in Shibuya, I was leaving Tokyo for a few days and heading to Kyoto. I didn’t have my schedule planned out in advance at all, so I had to decide what to do on my first day there. I had seen photos of Fushimi Inari shrine and the famous Torii gate-lined trails, but didn’t know anything about it beyond that. Once I arrived in Kyoto, I began to research what the different temples and shrines were that I wanted to visit, and where each was located. Fushimi Inari was one of the top shrines I wanted to see, but it wasn’t close to any of the others on my list. Since it was already late afternoon by this point, I decided that is where I’d go that day, since I didn’t have time for anything else anyway. 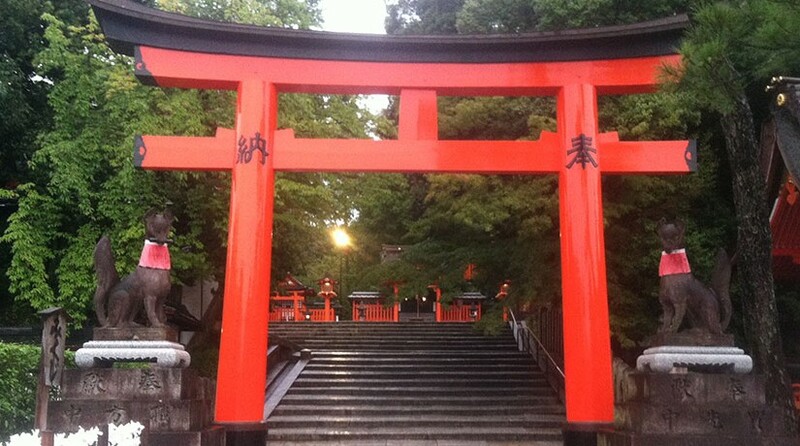 And since Fushimi Inari doesn’t have a closing time like other shrines do, it is a perfect one to visit in the evening. Fushimi Inari has two main features. It has beautiful architecture at the front of the shrine which is well worth looking around in. But the real draw for me was the mountain path behind the main shrine. This path is lined with the Torii gates it is famous for. At this point, it had started to rain some. While I did end up getting pretty wet as it kept raining as I entered the shrine even with an umbrella, it may have been to my benefit. Whether it was the rain, the time of day, the fact that it was a weekday, or a combination of the 3, there were very few visitors to the shrine that day. I did run in to others, but it wasn’t like I was being held up because I had to walk behind anyone. There was usually no one else in sight while I was there. After walking down the road leading to the shrine, I finally reached one of the main gates. There is also a gate more in front of the shrine. This was one of the largest gates at the shrine. This is the Romon Gate (Tower gate) leading to the main shrine building (Honden). Unfortunately my camera battery gave out at this point, very early on into my visit. I used the camera on my iPhone 4 for the rest of the day. This gate leads to the main mountain path of the shrine. The fox statues on either side of the gate are a common theme throughout the shrine. Now begins the famous path densely lined with Torii gates. Each gate has the name of its donor and the date inscribed on the back. For a short while, there is this double row of Torii gates. They lead the same place. Along the path are many smaller shrines. Some of them have hand washing stations, which in Japanese tradition is done before praying at a shrine. There are also many gates at each of these smaller shrines, and the size of the gate is determined by the size of the donation. Many smaller shrines have large stacks of small gates. The shrine became more heavily wooded as you progress further up the path. Some of the shrines along the path vary in appearance, while others look very similar to each other, sometimes leading to wondering if you have already been there and got turned around. This shrine shows how small the Torii gates can get. Eventually, you will reach a part of the path where you have a great view of the city. By this point in the day it had gotten quite dark and so I had a great view of Kyoto at night. I am trying to learn Japanese, but I don’t know what this sign says. Does anyone want to translate it? This is what I meant when I said there would be stacks of smaller gates. According to Japan Guide, the starting price for these gates is 400,000 JPY, or almost $5,000. I saw several cats along the path, probably that live in the woods. One of them I saw was nursing kittens. Fushimi Inari-taisha ended up being one of my favorite sights in all of Japan. The whole mountain path took about 2-3 hours to climb all the way up and back down, and while it was very tiring, it was an amazing experience. The diagram of a tori gate is pricing for the large tori gates. [The ones you can stand under. ]175k yen starting price. The little ones don’t cost that much. Oh, that makes sense. Thank you!